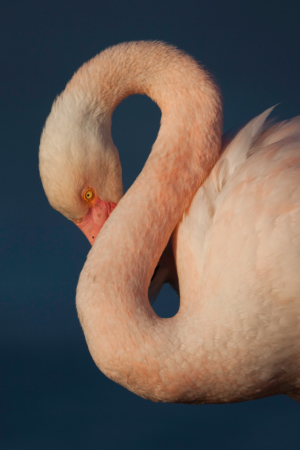 By adopting a Greater Flamingo, you will be supporting a network of Flamingo researchers throughout the Mediterranean region. Your contribution will directly support our study and protection of the Greater Flamingo by enabling us to purchase the equipment required for birdwatchers in North and West Africa, and the Middle East. Reading the rings on flamingos’ legs of is a difficult task, and mistakes are sometimes made due to the poor quality of the equipment. For example, binoculars can only be used to read a ring if a Flamingo is less than 50 metres away, which is rarely the case, whereas with a telescope the sighting and reading can be done at a distance of 300 meters. If you adopt a Flamingo, you will be informed about where your Flamingo is throughout the year, and whether it breeds successfully. You will get an e-mail every time “your” Flamingo is sighted, and you can view the log of its movements in a table and on an interactive dynamic map. Your annual contribution amounts to €25 per Flamingo, but is eligible for a tax deduction. For example, if you adopt two Flamingos (2 x 25 = 50 euros), it will only cost you €17 after your tax deduction, because 66% of your contribution is tax deductible, if it amounts to less than 20% of your taxable income (art 200 of French tax law). These fiscal advantages are only valid for French taxpayers. Of course, you can adopt as many Flamingos as you want per year. All the money you donate is used to purchase equipment or to finance our monitoring programs of several species (Flamingos, White spoonbills, European pond turtles, Slender-billed gulls…). Over 765,000 rings read in 40 years (the record was 30,000 in 2013), by 5500 different people. How can I adopt a Flamingo? To adopt (or offer as a gift) one or more Flamingos, visit this page or download the adoption form and send it to the Tour du Valat. You can also contact us : e-mail.